This is the first edition print (later edition has different demons). It is #54 of Klompmakers' book on this series. "Konseimaō Hanzui is in charge of a large robber gang which resides on the Mountain of wild grass and stones (J. Bōtōzan) near Ryōsanpaku. He possesses magical powers and is able to conjure up wind and rain. One day Kanchikotsuritsu Shuki... hears of Hanzui's plans to subjugate the Ryōsanpaku gang. Kohōgi Sōkō and his men begin a counter-offensive and eventually the magic of Nyūunryū Kōsonshō... overtakes Hanzui's. Hanzui, his second -in-command Hitenraisei Rikon... and Happinata Kōju... all join Sōkō's legion and Kōsonshō instructs Hanzui further in magic. In chapter 95 Hanzui measures his strength in a fight with the enemy general Kodosei who, like himself, also has magical powers. 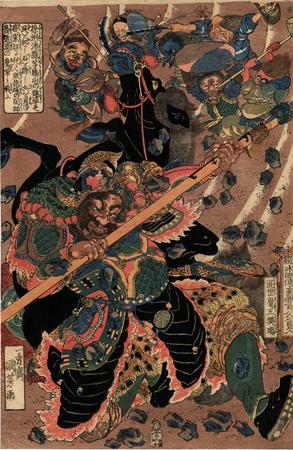 Kōdōsei proves the mightier and he tries to destroy Hanzui by conjuring up an enormous storm in which an army of 'divine soldiers' appear: this moment is depicted in Kuniyoshi's print. The demons and strange creatures attack the crouching figure of Hanzui who attempts to defend himself against this violent onslaught. The wind is so strong that stones are tossed up into the air. Following this scene, when Hanzui almost seems defeated, Kōsonshō appears and assists him. He uses his magic to make the wind disappear and this causes the 'divine soldiers' to fall to the ground with a great crash. Kōdōsei escapes, only to be captured later. Two different editions of this scene are known by Kuniyoshi, who later altered the composition and the manner in which the demon army is depicted. According to Suzuki, the earliest edition shows the group of demons in color and surrounded by black contour lines. Recognizable among those creatures in a type of tengu (long-nosed goblin). The later edition illustrates different, albeit fewer, demons. These 'divine soldiers' are devoid of color and have brown contour lines. Other differences between the two editions include a brown background in the early edition with the later version having a black-grey color in bokashi (graded color painting). The brown and iron-red sections such as Hanzui's face in the early edition is more orange in the second. In general the colors of the later version are harsher than those of the first." From Of Brigands & Bravery by Inge Klompmakers, Brill Publishing, p. 168. 1) in Kuniyoshi by Juzo Suzuki, Heibonsha Limited, Publishers, 1992, no. 83. 2) in color in 浮世絵八華 (Ukiyo-e hakka), vol. 7 (Kuniyoshi), Heibonsha, 1985, #2. There is also a small black and white illustration on p. 120.